Luke & Leia team up with a would-be Jedi to save a planet from the Empire. Responding to a faint distress call, Luke, Leia & the droids discover Prince Denid, heir to the planet Velmor, who fled his planet after the death of his father and an Imperial-backed coup supported by his younger brother. He is accompanied by Jedidiah, his longtime protector, who turned down his dream of becoming a Jedi to stay with Denid. 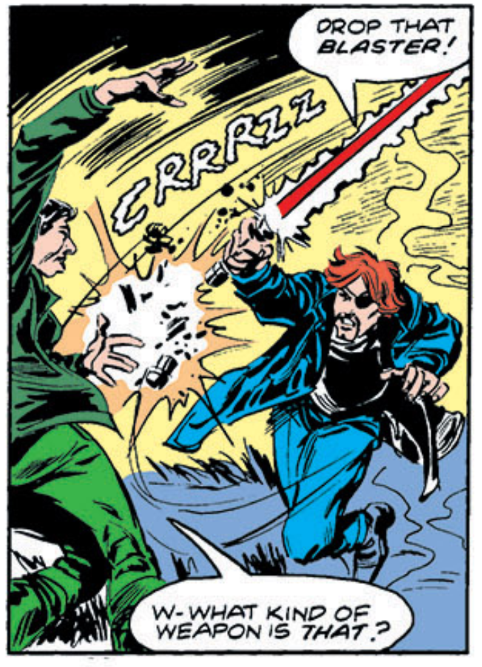 During the crash, Jedidiah was injured, and now believes himself to be a Jedi, much to Luke's dismay. Together, the group departs for Velmor, hoping to return Denid to power , thus keeping Velmor from siding with the Empire. With Luke posing as a smuggler and Leia as Denid's betrothed (who died in the crash), they interrupt the coronation of Denid's brother. While Denid's claims are being investigated, Imperial Captain Traal approaches the disguised Luke and makes him a deal to kill Denid. He plays along, until he's forced to use his lightsaber,revealing his identity to Traal, when Denid & Leia are attacked by Denid's brother, Outnumbered, Luke uses the Force to contact Jedidiah, who springs into action, delaying Traal at the cost of his life while Luke deals with Denid's brother & his treacherous regent. With Traal captive and his brother dead, Denid is crowned ruler of Velmor, but Leia turns down his proposal. 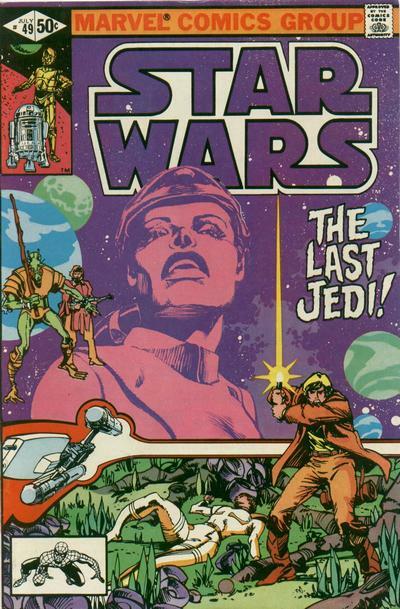 As they leave the planet, Luke sends Jedidah's body into space, saluting him as a true Jedi Knight. Walt Simonson, who filled-in on issue #16, returns to the series this issue, beginning his run as the series' new regular penciler (though he'll be joined by a few friends next issue). 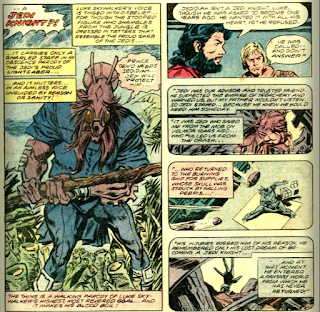 He is joined by inker Tom Palmer, who will remain with the series even longer than Simonson, in the process giving the series some artistic consistency post-Infantino, despite the variety of pencilers who will cycle on and off the book in the years ahead. 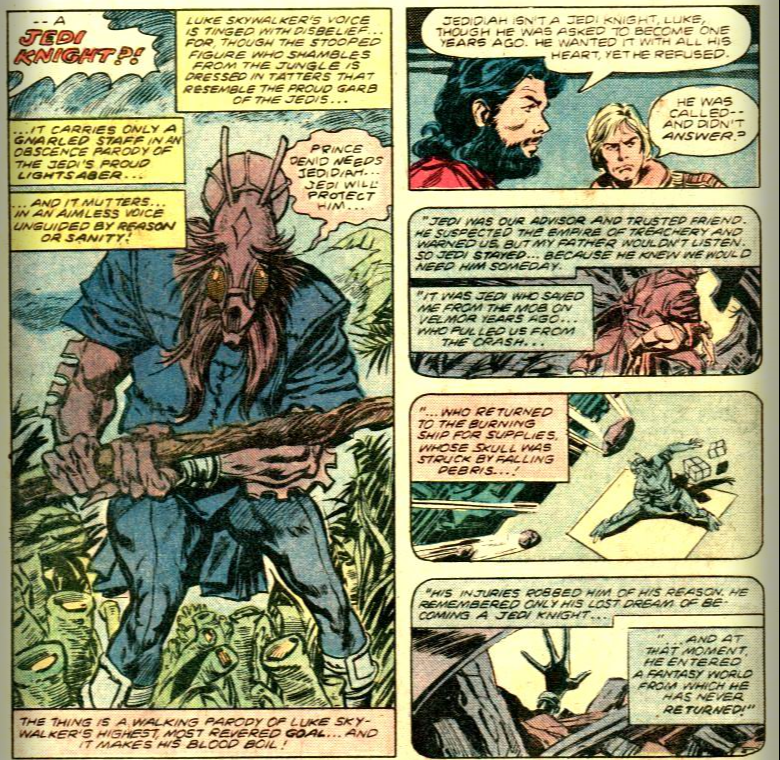 Prince Denid of the planet Velmor, a former Jedi named, uh, Jedidiah and called "Jedi" throughout, and Imperial Captain Traal all appear for the first time this issue. None make any further appearances, but are mentioned in later online reference material. Leia getting romanced while trying to get a planet to side with her over the Empire is a plotline the Expanded Universe will return to again, notably in the form of Prince Isolder and the Hapes Cluster in The Courtship of Princess Leia, the book which first hitched Han & Leia back in the day (with the Hapes Cluster going on to become a recurring element in the novel EU after that). Still searching for a new regular writer, Mike W. Barr fills in for this issue. 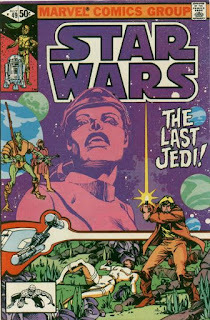 Luke says that Jedidiah is wearing something akin to traditional Jedi garb; squint, and it could be seen as an approximation of the blue suit worn by a young Obi-Wan in the flashback issue #24. Luke's bionic hand assists him during a bit of climbing. 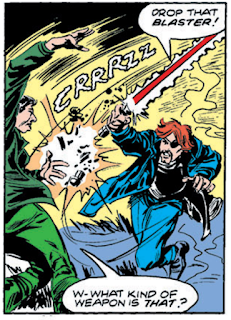 Luke's lightsaber blade is colored red several times this issue. Luke references that favorite pre-teen makeout game, Spin the Bottle (no word yet on whether or not he ever played Seven Minutes in Heaven at Tosche Station). In practice dueling with Jedidiah, Artoo advises Threepio to let the Jedi win, a callback to Threepio's advice to Artoo while playing dejarik with Chewie in the first film. Luke spends much of this issue jealous about Leia and Prince Denid, especially after the prince proposes to Leia. In the end though, Leia turns down Denid's offer of marriage, saying her place is with the Rebellion (saying nothing about the man she loves who is currently encased in carbonite and being held by a bounty hunter en route to one of the biggest gangsters in the galaxy). This issue is kind of a mess, on several fronts. Like most of the series' post-Empire issues, unfortunately, it seems to have been created before or take place in a time prior to Empire Strikes Back - Luke is pining for Leia, Leia rebuffs the romantic advances of Prince Denid but makes no mention (to him or herself) of Han. It features far too many characters and seems overly-plotted for a one-and-done story, especially in terms of the villains, with three separatist antagonists with mostly similar goals, the end result being that they all blend together and kind of get lost in the narrative. 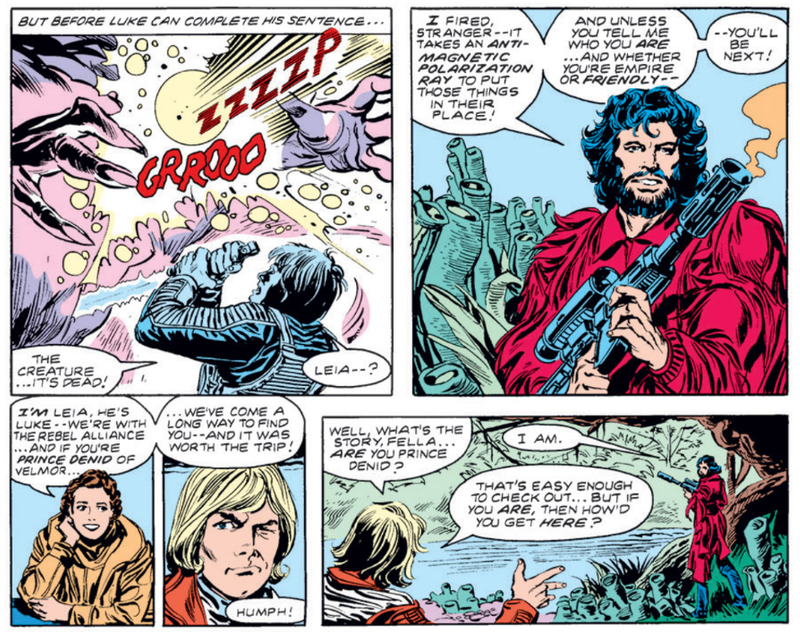 The issue also seems unclear about what it's ultimately about - Luke's jealousy of Denid, or his initial disdain followed by respect for Jedidiah, or the political machinations on Velmor. Certainly, the story could be about all three things, but again, that's a lot of different plots and themes for twenty-two pages. Then there's Jedidiah. 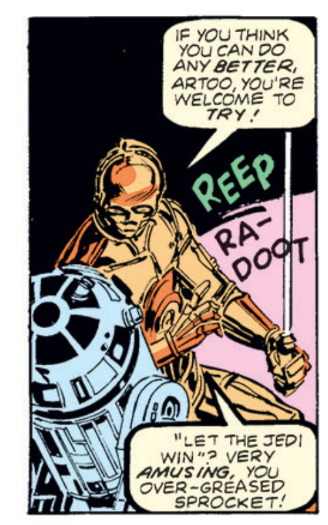 It's probably not fair to let one specific hangup derail an entire character, and there's certainly some potential in the idea of Luke meeting a former Jedi that, for whatever reason, doesn't live up to his expectations of what the Jedi of old were like, but man, it's hard to get past that name. Having a Jedi named "Jedi" (as Jedidiah is called through most of the issue) in and of itself is pretty dumb; having "Jedi" be a shortened form of "Jedidiah" is even dumber (I look forward to when we meet a female pilot named "Pilotette" who goes by Pilot). I really don't get what Barr is going for here (aside from sheer character-naming laziness), and it's distracting to the point of tanking the entire story. On its own, the Jedidiah thing could be ignored. Laid on top of the issue's other problems, it's the terrible icing on an already-bad cake. The end result is one of the series first outright clunkers in a long time. Archie Goodwin returns to say goodbye in the series' 50th issue. Yeah agree on all fronts but it's a great Simonson cover!